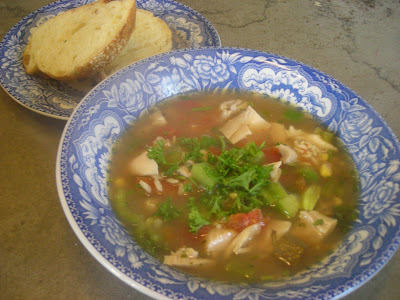 Is the day for chicken soup! Often our lunches at Linderhof during the week are leftovers for lunch -- not just heated up but "reworked" into something different. Dinner vegetables are often sauteed in a bit of butter or olive oil, then added to hot chicken broth and pureed. Often a bit of cream is added to make a creamy vegetable soup. Slices of good bread accompany the soup and if there is dessert it is fruit. I heated up some chicken broth, took the chicken off the bone and added that as well as some corn, tomatoes and okra and a bit of green pepper that was lurking in the fridge. A half cup of cooked rice was also added. 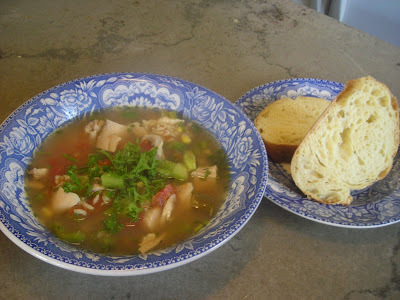 The good thing about making soup from leftovers is that it is a quick soup to make. It doesn't require long simmering but is ready in a matter of minutes. It definitely makes for a quick lunch! It was a bit chilly that day and the warm soup was perfect for lunch! Husband Jim even had two bowls! I must admit that we are not overly fond of leftovers when they are just a replay of the meal you ate just before, but I don't mind using leftover food to make a new dish. And luncheon soups are the perfect way to use up whatever you have leftover from dinner the night before. That looks so delicious! I must admit, I'm not good reinventing leftovers, but I'd eat your soup in a heartbeat. It looks lovely in your blue transferware bowls. I think blue is a nice contrast color to serve food on. I like your method for soup-making. re your last post - I laughed out loud...we had a similar situation featuring a ham and a huskey dog. It wasn't pretty! A great way to re-serve yesterday's meal...for sure! Thanks for your visit...and your comment. I've enjoyed my time here...and love your large serving tray from Pottery Barn. I think I will look for one as well. Martha! 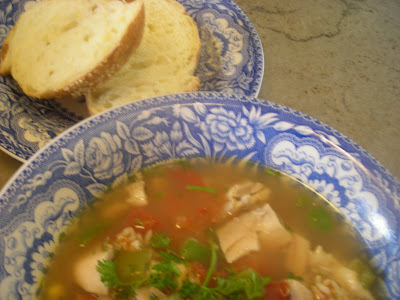 That soup looks ummmm.... and on weekends I often make "leftover" soups, too, for our lunches. They are soooo good. Yes, I remember Prince Albert in a can. And... is your refrigerator running? GO CATCH IT!